The humble origins of the modern day familiar casino chips were born out of necessity. In the early days when the game of poker first became popular in the USA, casino chips were unheard of. The game of poker first developed in the mid 1800’s along the Mississippi and other saloons and bars throughout the West. In these early days, and with the growing population travelling west to answer the call of the gold rush along the Californian coast, the earliest organized games of poker were played with whatever things of value a player could bring to the table, be it gold dust from panning the local river to a chance golden nugget found glimmering on the riverbed. No doubt this is how the famous Las Vegas casino got its name of Golden Nugget! Soon enough however, it became apparent that a different system had to be introduced to make the game more manageable and to avoid shoot downs across the poker table from gun happy gamblers who felt they had been cheated. Therefore an early form of chips were introduced that could be exchanged for money or gold. These early models would have been rudimentary pieces of ivory or bone, wood or paper or sometimes clay. However these were too easy to copy and players would often play with their own such chips. Many poker playing establishments would often end up with many more chips than they had started out with! 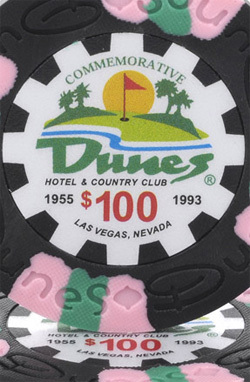 To find a solution against such abuse, early casino chips would carry a particular design to distinguish one establishment’s chips from another. This could be done by engravings with a number of different designs and motifs as well as stickers that were either pasted on or with an in-lay. This was the first step towards chip differentiation in reply to gamblers attempts to forge early plain casino chips. With the growing popularity of the game of poker and gambling in general among the ever increasing population of the West, a market developed to manufacture a whole range of different casino chips. From as early as the 1880’s onwards right up until the early half of the 20th century, a number of casino chip manufacturers sprung up offering thousands of different designs in a large number of available colours that could be made to order. One of the leading casino chip manufacturers of its time was the U.S. Playing Card Co. In the early half of the 20th century they developed casino chips that were made from clay with an imprinted lithograph which was then coated with a polyurethane liquid used as a seal covering the casino chip. Such casino chips were made from around 1940 right up until the company closed in 1985. Since around the same time in the early 1940’s, plastic became the material of choice for mass produced casino chips right up to the modern day. As well as being cheaper to manufacture, they are more durable and easy to design in many different ways. However, the modern plastic casino chips fail to offer the quality of the early more expensive clay casino chips.